I was privileged to be brought up with two grandmothers who were both really great cooks. My Chinese grandmother from Shanghai made Chinese food that I had never tasted in any restaurant anywhere. She was cooking a ‘fusion’ type of Chinese food back in the ’50s, substituting for ingredients not readily available in the USA at that time. Somehow she made light sauces, greaseless noodles and entirely unique tastes. My Egyptian grandmother cooked all manner of North African food — a wicked couscous, bisteeya and highly addictive. Quite frankly, I do not remember ever having a bad meal until boarding school in England. I first met Bobby Chinn in Hanoi two years ago when I was there to shoot the ASEAN 100 LEADERSHIP FORUM event. On the first night I checked into the hotel, I rang his restaurant (walking distance from the hotel) not expecting to speak to Bobby in person but just to ask if he was going to be in town that week. A lady answered and next thing I knew, she called out, “Bobbbby …” and the rest was history. We chat briefly, told him I was there for a conference and would love to drop by his restaurant. Next thing I knew, he was one of the guests at the conference. Two years later, (thank you Marul for the invite) we have a reunion in our humble abode and what an honour to have Bobby visit the Brunei capital and my home town, Kuala Belait. I can relate to this “… I left pursuing an interest in anything outside of wearing a suit and tie. — Bobby Chinn” although I sometimes have to wear a suit and a tie. Leaving 13 years of IT mileage to pursue “anything outside of wearing a suit and tie” was perhaps the hardest, scariest but rewarding decisions I’ve had to make. In the two days, Bobby autographed countless books (well, if I wanted a number I could ask Agnes of Early Childhood Publications who carries the Bobby Chinn books in Kuala Belait but you know what I mean). Those who came for the demo and had a book or two autographed know just how extremely accommodating Bobby was when it came to individualized messages from his heart. I wanted mine to be signed in Belait where my heart and home is. In my many conversations with Bobby, I meant to but had forgotten to tell him that he’s the second international celebrity to have visited the Belait district, after Prince Charles and Duchess Camilla. I’ve pretty much isolated myself at my in-laws in Bandar Seri Begawan for the week long nightly tuition to prepare for a life changing exam. With the exception of my laptop and a 1TB drive that contains most of my recent work, I’ve left my camera at home in Seria so I won’t get tempted to go out for a shoot and lose track of time when I really should be revising. So the months of April and the critical weeks leading up to the big day in May will be very quiet as far as blog updates and articles for my weekly Brunei Times column goes. What you could do for me is wish me luck and perhaps say a little prayer for me. Those of you whom I had the pleasure of mentoring recently in the Louis Pang Shoot Like A Pro workshop (hello Brunei Forever members) last Sunday might have some idea what life changing exam I’m sitting for next month. I don’t particularly fancy the idea of seeing my wife and kids on the weekends and I’m going to miss Jewel’s University for Children graduation ceremony this afternoon. I like being close to my family but life’s like that—we make small sacrifices for greater good. 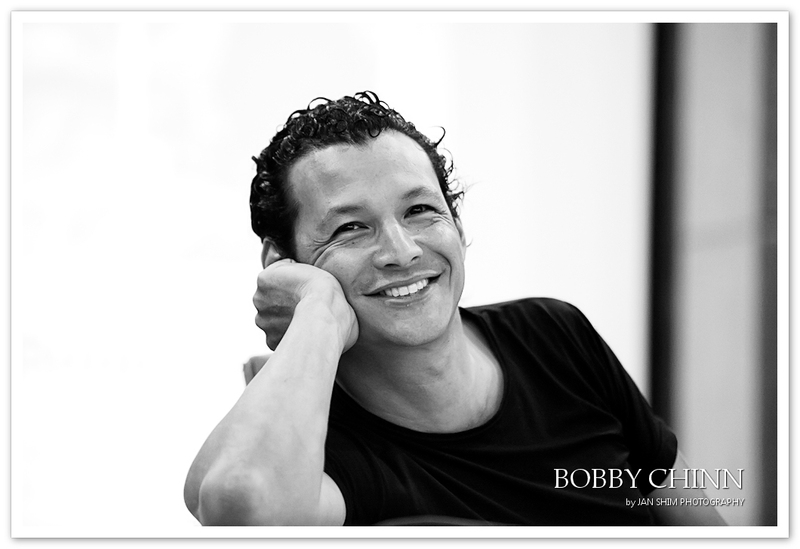 So yeah, I promise I’ll roll out the rest of the Bobby Chinn and Louis Pang workshop pictures ASAP. Check out the full page Hornbill article in The Brunei Times this Friday (April 24, 2009). Oh and by the way, to fans of Bobby, if you cannot resist the urge to download this black and white portrait (one of my favourites in this series and I hope you like it too) I won’t hold it against you. In fact, I’m feeling generous and have uploaded a slightly larger version that you may like to keep (even good enough for 3R/4R print). And another thing, even if you did not obtain an autographed copy of the book, I recommend getting a copy simply because it has great content, mouth watering recipes and above all, a great story and street photography by Jason Lowe. Bobby has this to say about Jason. Inspiring stuff. Call Agnes on (673) 8836661 to reserve a copy. Starting with the press conference during which time Bobby unrolled his tool bag and gave us a tour of his equipment. If only I could do the same with two camera bodies, three lenses, two flashes, 3 pocket wizards and the list goes on … we work with RAW files, Bobby works with RAW vegetables. Appropriately titled book. If you get a chance to visit Hanoi or its capital city Ho Chi Minh for that matter, do let me know if cross the streets doesn’t give you a heart attack. It’s quite an experience really and you’ll quickly learn a thing or two about survival there and I enjoy its laid back culture and very traditional way of life. In spite of a well traveled life I’ve had, I’m still very much a kampong boy at heart. For that reason alone, many potential employers have failed to convince me that I needed that extra rung or two on the corporate ladder or to relocate to Bandar Seri Begawan for that matter (I know eventually I’ll have to when the kids leave their nest). Kristal DJ and event MC Jenny Malai Ali announces the arrival of the celebrity chef. Here’s a breathtaking view of Bandar Seri Begawan from the twelve floor of the DST Tower. Bobby Chinn with his raw materials. He cooks raw and I shoot raw (well, sometimes). I recently bought one of these electrical hot stove and it’s mind blowing how fast water boils when you use the right pan/pot. As Chef Muhammad discovered in KB, a wrong pot refuses to work even at 1000 deg C. Seriously good stuff for the occasional steam boat at home and way safer than the potentially deadly propane boilers. When things go wrong, you lose more than just your appetite! The combination of light and shadow on Bobby’s face makes this one of my favourites. Two Indonesian guests perusing Wild, Wild East, Bobby’s first publication. Foodie extraordinaire Thanis Lim checking out Bobby’s book. When it comes to Vietnamese cuisine, Fish Sauce plays a pivotal role. A key ingredient Bobby cannot emphasize enough. Squeezing lime in Slow Mo. Happy campers at the KB event. Even though the crowd here wasn’t big in numbers compared to DST, we did have a more intimate gig. Guests enjoyed themselves in various degree and pockets of laughter. Thank you. I have also received a number well wishes by email too. Each one is deeply appreciated. I don’t think I did but I would like to see what you captured seeing that you were pretty busy taking pictures of pretty much everything that afternoon 🙂 I hope Isaac of ECP took a photo of you and Bobby when you had your book signed. I wish I could stay longer but I really had to go as I was already late for a dinner appointment. Let’s put in our wish list for more celebrities to visit us and when they do, to come back more often! Good luck 🙂 And I’ll say a little prayer for you. First of all, I like to wish you good luck! Enjoy your story telling in this one and the pics were wonderful. Man, I love the way you work in the kitchen. You are one amazing man, why can’t there be more men out there like you?